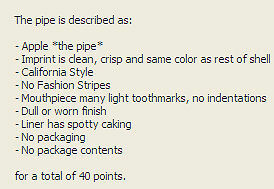 The value of pipe #726 is 40 points. Ain't it grand! It's got to where I don't even need to go to eBay or a show to get a good pipe! J. and Louise Jones went to the Summer 2006 New York show last week-end and stopped by on their way home for the steak dinner I owed them. Imagine my delight when they came bearing gifts, among them this very nice pipe! As luck would have it, James Owen had just last month given me a Raspberry Apple and mentioned that he really wanted a California Style. So, this one is his now!